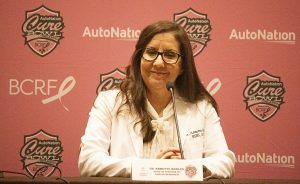 Saturday’s AutoNation Cure Bowl has raised $3.55 million for breast cancer research in the last three years – with over $1.1 million going to College of Medicine researcher Dr. Annette Khaled. And at a pre-game press conference Dec. 15, Dr. Khaled and football players from Tulane University and Louisiana-Lafayette talked about the impact of breast cancer, which will kill more than 40,000 Americans this year. 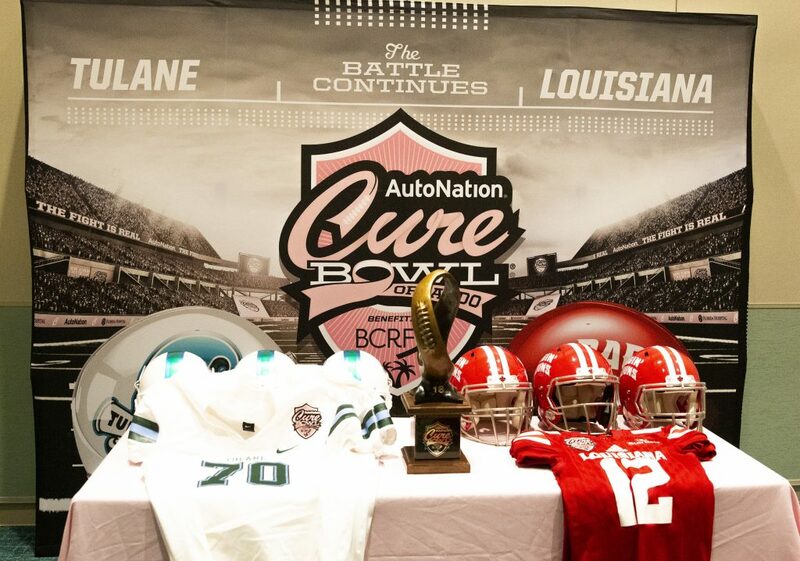 The annual NCAA bowl game in Orlando raises money for the Breast Cancer Research Foundation (BCRF), the largest private funder of breast cancer research worldwide. One of the game’s largest beneficiaries is Dr. Khaled,. “The work that we’re doing right now at UCF is really mostly due to the Cure Bowl’s endeavors,” she said. In 2012, Dr. Khaled discovered a peptide called CT20 that kills metastatic cancer cells. The peptide disrupts chaperonin, a protein that prompts the folding mechanism inside cancer cells. If the inner workings of the cell can’t fold into 3D units, the cell dies. She and her team developed a technology using nanoparticles that are programmed to carry the peptide through the bloodstream to attack metastatic cancer cells. And recently, her lab has been working with “liquid biopsies,” which can analyze spreading cancer cells in patients’ blood to help identify those whose tumor makeup would most benefit from their therapy. Dr. Khaled said the Cure Bowl funding and support from BCRF have accelerated her work to find a cure while helping raise public awareness about her research. “We’re moving forward,” she said. The Cure Bowl begins at 1:30 p.m. at Camping World Stadium. Tickets are on sale at https://fevo.me/2O0c0P4.